Retro style baby shower invitations are super sweet and especially cute when they're created to look like popular styles from the 1950's and 1960's. Here we offer the following six different Mid-Century Retro Baby Shower Invitations as proof. This post contains affiliate links which means if you make a purchase after clicking one,Bonnie or I might make a small royalty paid to us from Zazzle. This never costs you anything extra. We appreciate your support! Learn more HERE. Each of the following Retro Baby shower Invitations is being brought to you via Zazzle, a world leader in amazing custom and personalized paper products, apparel, gift items and more! So simple and yet so sweet! I can't think of a more tender way to announce a baby shower than with an invitation featuring a pair of classic white baby shoes. I love the modern retro styling of this baby shower invite that features a layette straight out of the sixties. This red and white check baby shower invitation featuring a modern mom wearing striped Capri-style pants and holding a sweet baby looks like it came back to the future from the fifties. Classic mid-century art styling makes this cute invite the perfect way to invite guests to help the happy expectant mom and dad celebrate their coming bundle of joy. This gender neutral design features a classic car and is perfect for a retro themed baby shower. This cute retro baby shower invitation design reminds me of a famous family who used to sing together. What so you think? This was just a very small selection of all the cute retro-style baby shower invitations available to you from the talented people who keep shop at Zazzle. Each invite comes complete with an envelope for mailing and a 100% satisfaction guarantee. Visit RETRO BABY SHOWER INVITATIONS to see them all. It's never too early to start planning your summer backyard bash and BBQ! ​These fun 5" x 7" Summer Night Patio Party Invitations feature a modern retro patio umbrella, table, and chairs with banner, lanterns, and a nighttime blue background with tropical leaves. Perfect for your next evening BBQ, Pool Party, Backyard Party, Family Reunion, Block Party or any other summertime outdoor get together celebration. You can customize them with your own text. This design is an original illustration by pj_design. You can order as many or as few of these great invites as you need. Each one comes with a white envelope and Zazzle's 100% satisfaction guarantee! If baby is expected this summer, why not throw a fabulous fun 4th of July baby shower in honor of the parents-to-be? We've discovered a few fantastic invites that are beaming with big bold red, white, and blue colors that can be used to gather the gang for a backyard combination BBQ and Baby Q. Whether you hold the event on the 4th or just want a patriotic theme, browse through our four favorites for the best 4th of July baby shower invitation for your happy occasion. Click on your favorites to learn more and/or order your invitations at Zazzle today! Our featured 4th of July baby shower invitations are red, white, and blue so they can be used for a little firecracker of either gender, boy or girl. 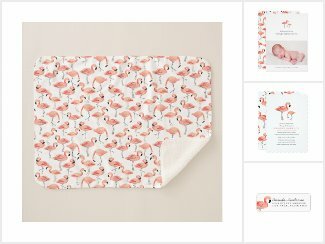 All of our featured baby shower invitations are being brought to you by our affiliate site, Zazzle.com, a world leader in custom and personalized paper products, apparel, and other gift and home decor items. They were designed by individuals who keep their creative shops there. that's why each invite is individually priced. ​Each invitation comes complete with a standard white envelope and a 100% satisfaction guarantee. These black and white 60's party invitations have a groovy twist. The design brings you back to the psychedelic sixties but it's all done in black and white color with unique font choices for the lettering. They can be easily personalized and customized for any occasion including birthday celebrations, girls night out, wedding, bridal, or baby shower, friendly get-togethers, or any other special event. Have a look at the front and back of these fun retro invites! These invitations measure a big 5.25" x 5.25". They come complete with a white envelope and Zazzle's 100% satisfaction guarantee. ​Not sure if these are just right?